Before your start motorhoming, there are essential things you must know. So, here is the guide of motorhome basics for beginners: Driving licence: First of all, the most important thing to know, is what type of motorhome you can drive. For this, nothing easier, you need to look at your driving license: – If you passed the test before 1 January 1997 You can drive up to 7,500 kg but after 70 years old, you must submit a medical form in order to renew your licence. 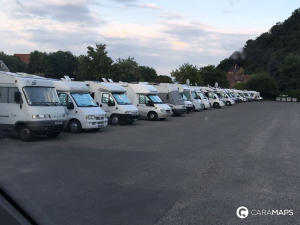 – If you passed the test after 1 January 1997 You can drive a motorhome up to 3,500kg, if you want to drive a larger and heavier one, you need to pass a C1 test. Motorhome insurance Having a motorhome insurance is essential and it constitutes a legal requirement. There are many insurance providers on the market, and a large range of policies. In order to chose the best one for you, better think about all your needs: the level of cover you want, the number of drivers, the type of motorhome your have, how often are you planning to use your motorhome, how far are you planning to go… Motorhome weight Knowing your motorhome’s weight limits is vital before leaving for a trip. You must know the maximum Authorized Mass (MAM) of your motorhome and not exceed it. It is the maximum your motorhome is authorized to carry, including passengers and items. While travelling one rule to remember: heavy items must be stored as close as possible to the floor. Speed Limits Motorhomes are restricted to the following speed in UK: For a motorhome exceeding 3050 kg or 8 passenger seats, and not exceeding 12 meters in length. Build-up areas: 30 mph Single carriageways: 50 mph Dual carriageways: 60 mph Motorways: 70 mph Where to Park Did you know that standard UK parking space is 4.8 x 2,4m and most parkings have limit barriers of 1,85 or 2m? This means that a motorhome can not go inside the parking, and even this was possible, you will need more than a single place to park. For all these reasons, the best thing to do is to look for an appropriate parking. Nothing easier! Just visit www.caramaps.com and you will find the best places near your location. Hope you enjoyed our guide of motorhome basics for beginners. You can also read our articles: « Plan a motorhome trip step by step » and « Top five accessories for your motorhome trip » on our Blog. Great information, thanks for this.